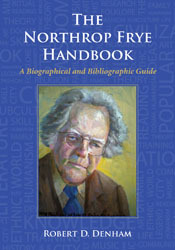 The McFarland Press had begun advertising the publication of The Northrop Frye Handbook, which should appear in the fall or the winter. This entry was posted in Bob Denham, Frye and Contemporary Scholarship, News on June 14, 2011 by Bob Denham. Well, McFarland has begun advertising the book but it won’t be released until later in the year–fall/winter, they say. Sorry to have got it wrong, Bob. The post has been amended.